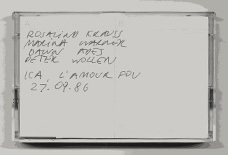 The Women's Audio Archive began as a series of recordings, taped by Lewandowska after leaving her home country in 1984, grown out of an interest in language as a site of cultural displacement. 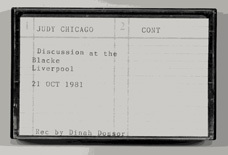 These recordings document public events, seminars, talks, conferences, and private conversations as valuable records of a particular time in discourse, beginning around 1983 until 1990. Lewandowska denotes this period of time as one dominated by academics and artists close to October magazine and by feminist gatherings, including the participating of Judy Chicago, Mary Kelly, Barbara Kruger, Yvonne Rainer, Jo Spences, Nancy Spero, Jane Weinstock, etc. 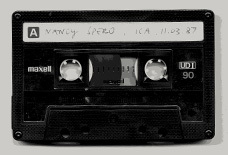 In a variety of settings and institutions, as well as in private, the recordings also document talks by artists and academics such as Benjamin Buchloh, Victor Burgin, John Cage, Allan Kaprow, Tom Lawson, Les Levine, Peter Wollen, etc. The act of sound recording began as a way to address the possibilities, as an artist and in everyday life, within a new, unfamiliar environment - through observation in gathering knowledge and participation in developing relationships. Having been educated and raised in a totalitarian state and under a Communist regime, the artist maintains a sensitivity to the power of representation, to the original and manipulation of images, thereby influencing her perception of how history is constructed, who keeps the documents, and who has access to public broadcast. Moreover, the emphasis on sound, away from the image, is a conscious decision by the artist to undermine the primacy of visuality. -- INTRODUCTION TO "WOMEN'S AUDIO ARCHIVE"